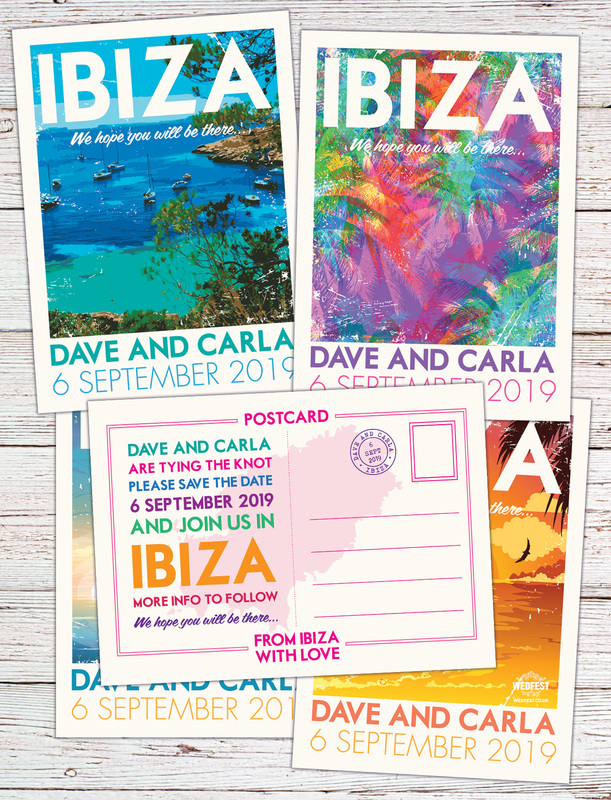 It is pretty cold outside right now as we write this so we are super excited to bring some warmth and sunshine into your life with this awesome set of Ibiza Vintage Travel Poster Postcards Wedding Invitations / Wedding Save the Dates. 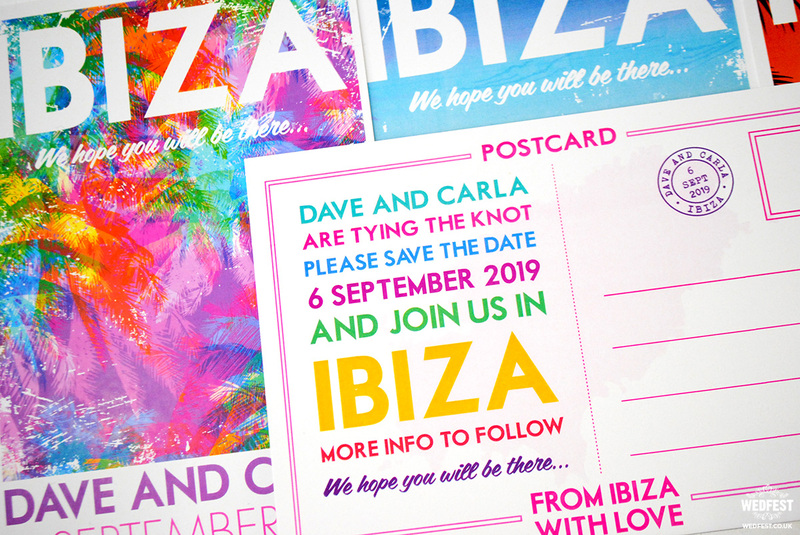 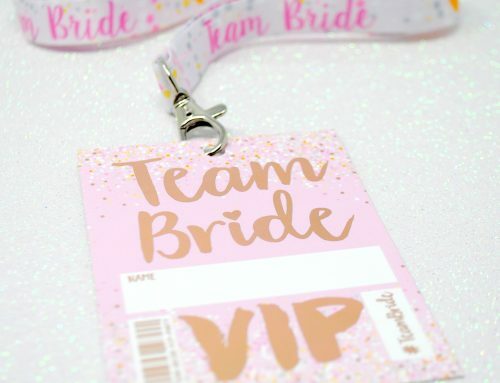 Carla and Dave are lucky to be having their wedding on the gorgeous island of Ibiza (our favourite place as you will know if you follow this blog) and they got in touch with Wedfest after seeing all the previous Ibiza Wedding Stationery we have worked on. 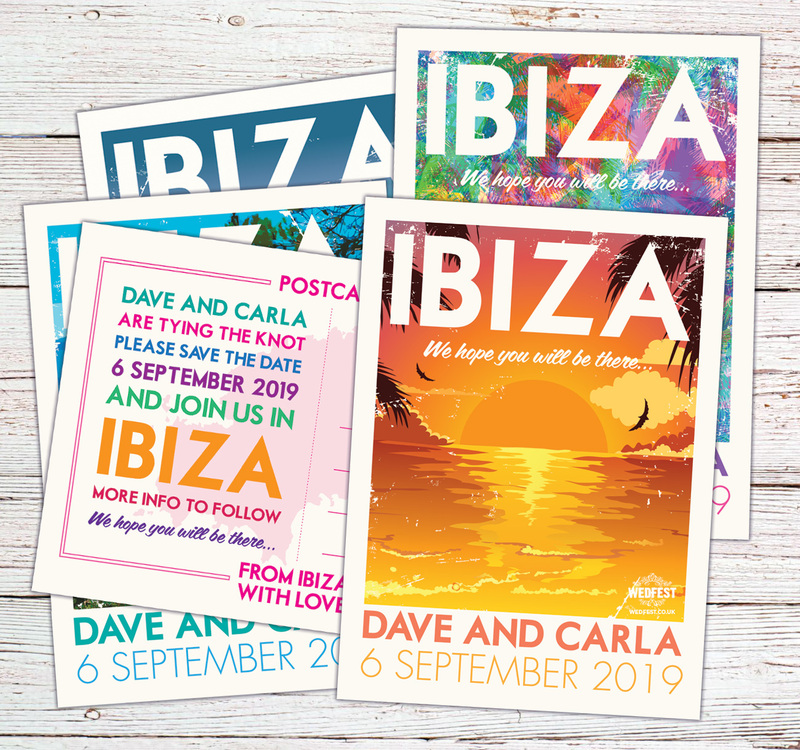 In their initial brief they had mentioned that they like the idea of a travel poster style postcard that showed off the island of Ibiza, similar to something you might send home while on your holidays. 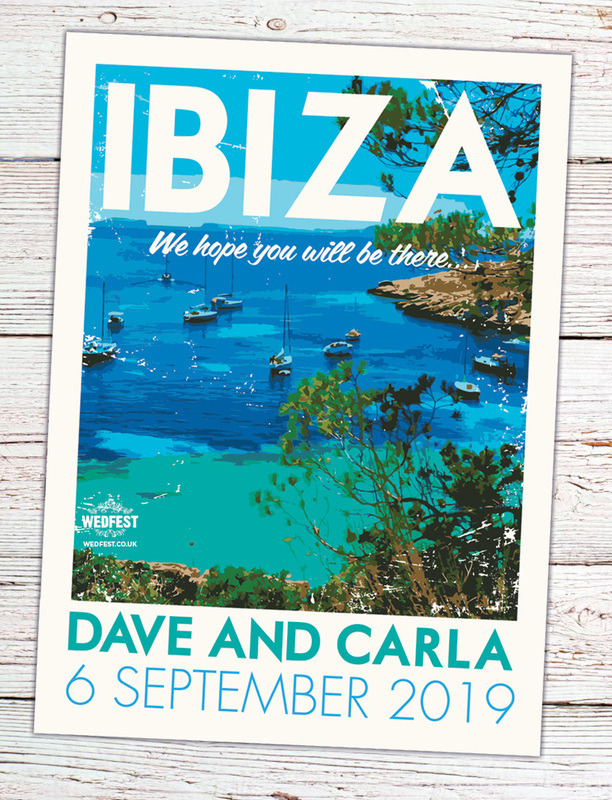 There is many different things they liked about Ibiza that they wanted to convey such as a the famous Ibiza Sunset, the beautiful beaches and sea and of course the nightlife and clubbing aspect of the island. 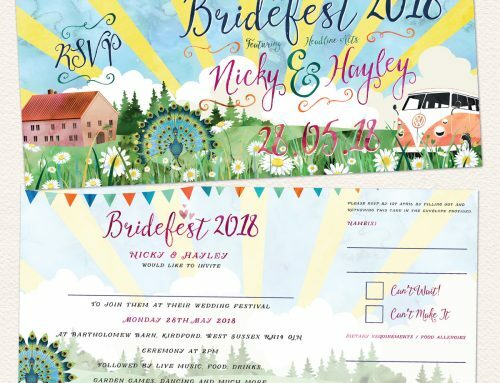 There was no perfect way of getting those various things into one poster design so we played around with a few different ideas and showed them to the couple and they ended up liking all of them and wanted to spread them out over their wedding save the date cards, wedding invitations, rsvp cards and wedding information cards. 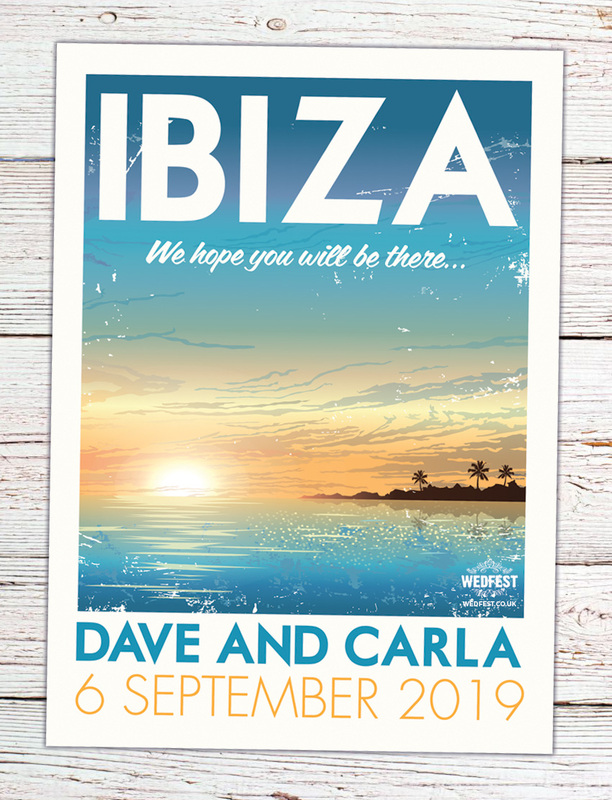 For the overall style of the poster / postcards we wanted to recreate that gorgeous classic vintage travel poster style vibe were there is an image of the location and a simple text stating the name of the country or location. 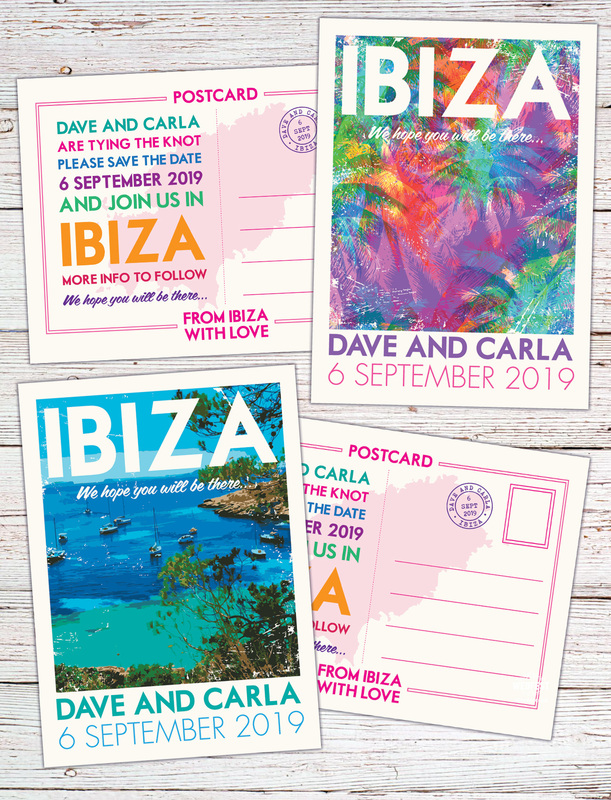 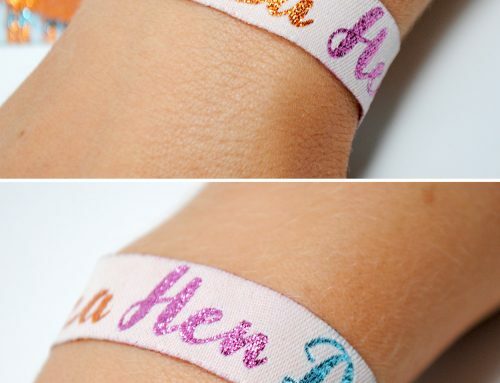 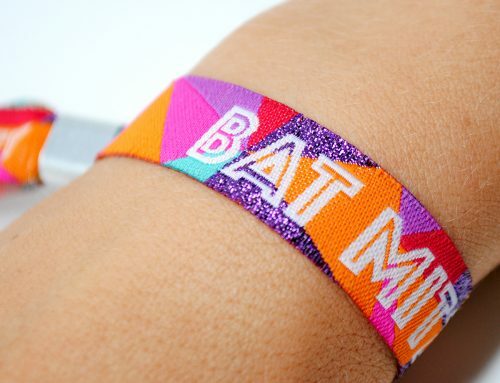 For these ones it worked so well as the word IBIZA itself just looks amazing. 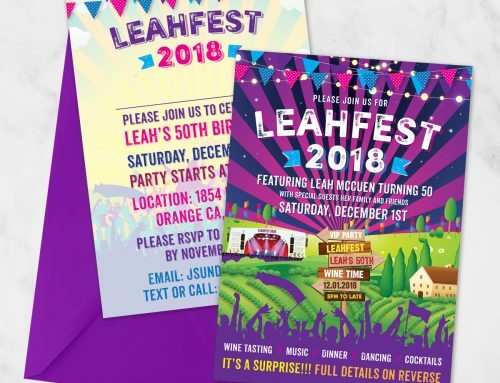 Trying to settle on a typeface was probably the longest part as the word looks so good in many different font styles, but the one we went with perfectly captures the look we were trying to create and it is simple yet powerful. 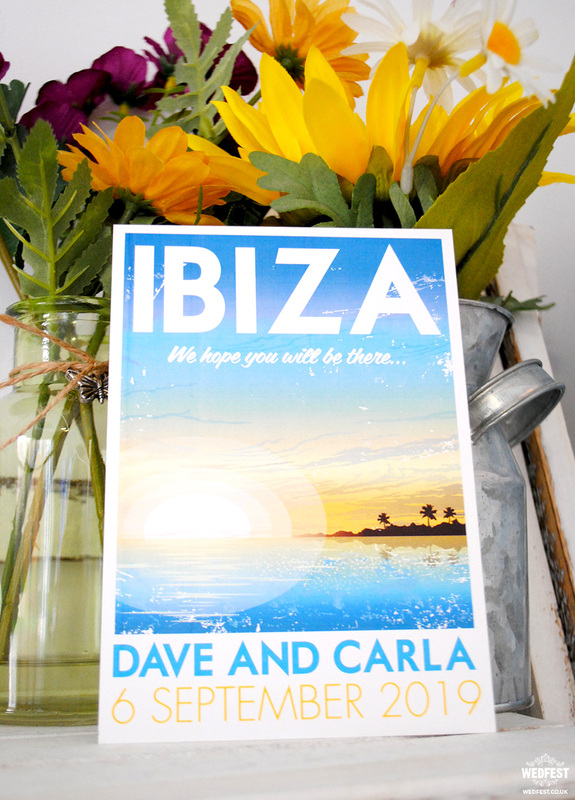 For the various different cards we wanted it again to be simple imagery to represent each of the aspects of the island the couple wanted to capture. 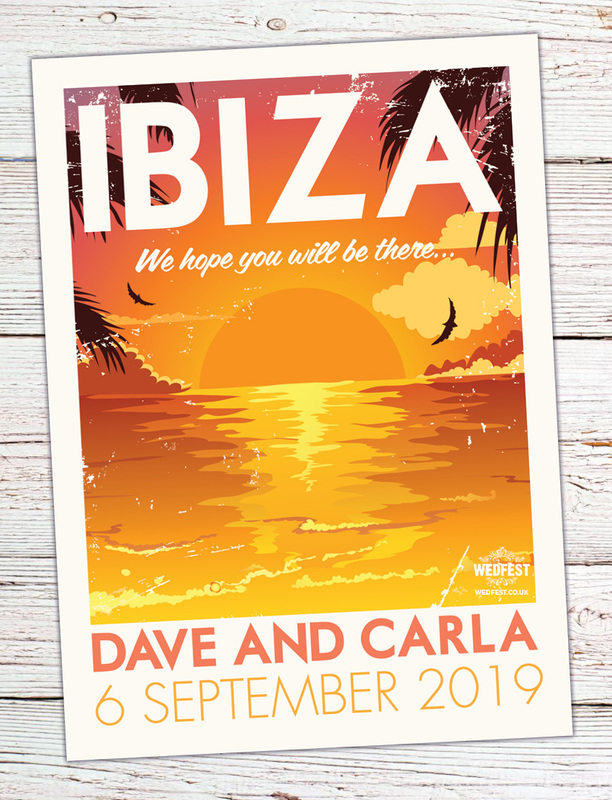 For the Ibiza Sunset Wedding Invitation we wanted nothing more than a simple but strong image of the sun setting into the sea turning the sea and sky orange. 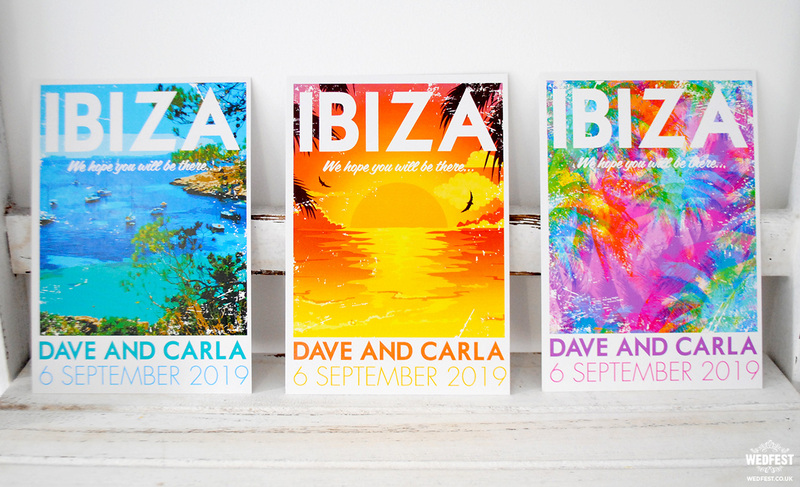 For anyone who has ever been lucky enough to experience the amazing Ibiza Sunset at Cafe Mambo or around the San Antonio area this image will be all to familiar. 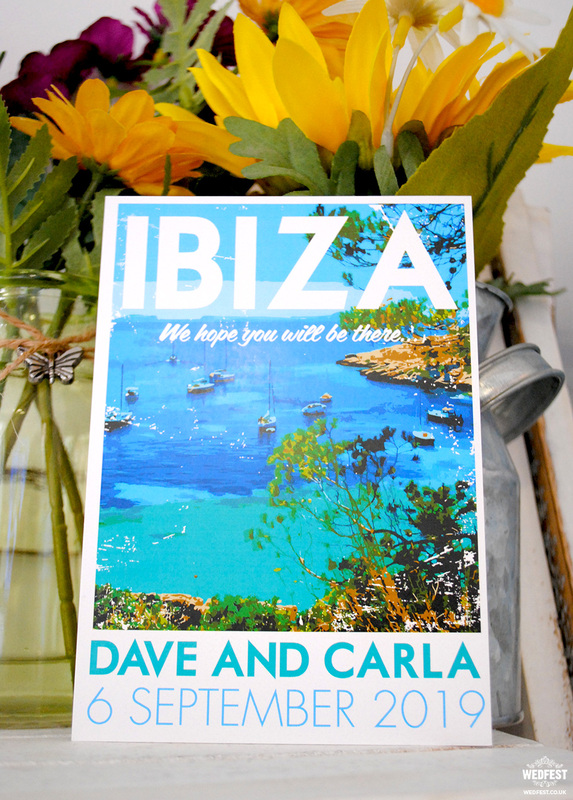 Another aspect of the island is the beautiful beaches and blue-green water that surrounds them. 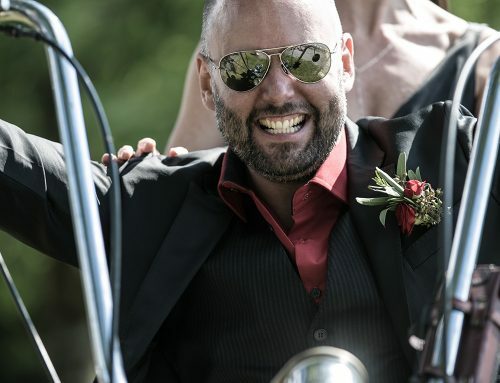 The couple chose a photo that they wanted to represent this and this turned out beautifully also. 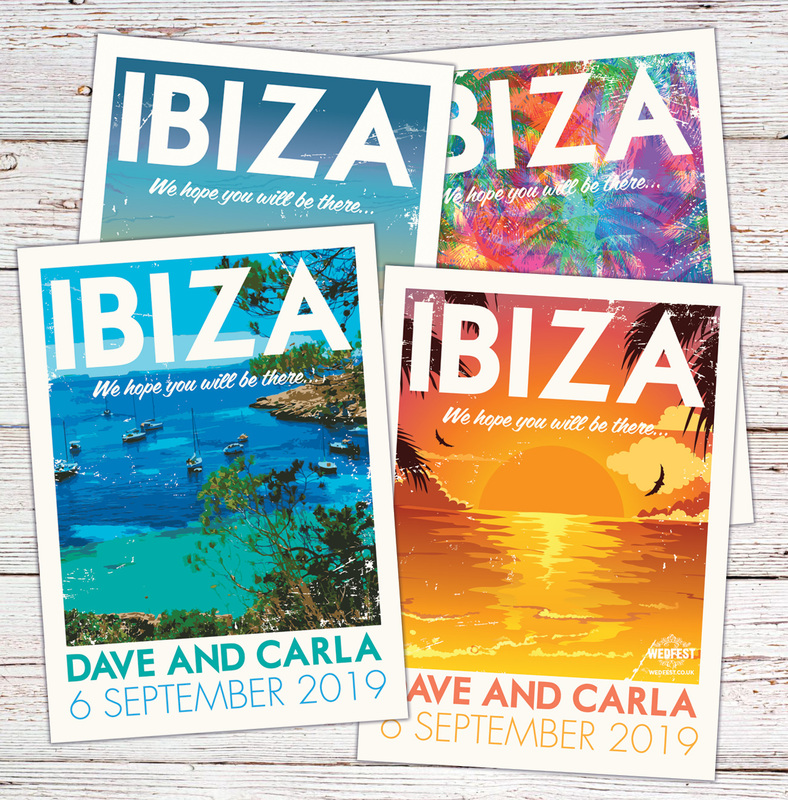 The water and beaches in Ibiza are so beautiful just looking at these images is making us want to dive right in for a swim. 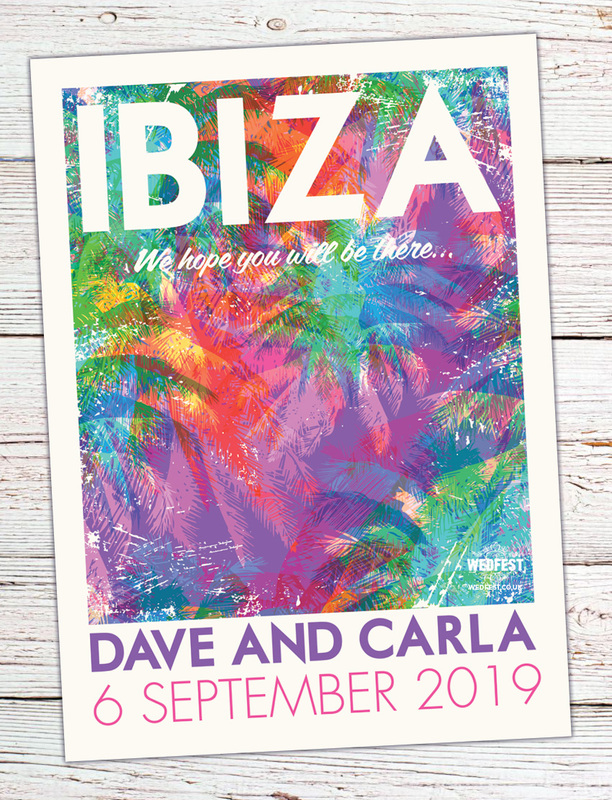 For the travel poster image to represent the nightlife /nightclubbing in Ibiza they couple stated that they did not want it to look like a nightclub flyer or represent the actual nightclubbing aspect too much so they were not sure how to portray it. 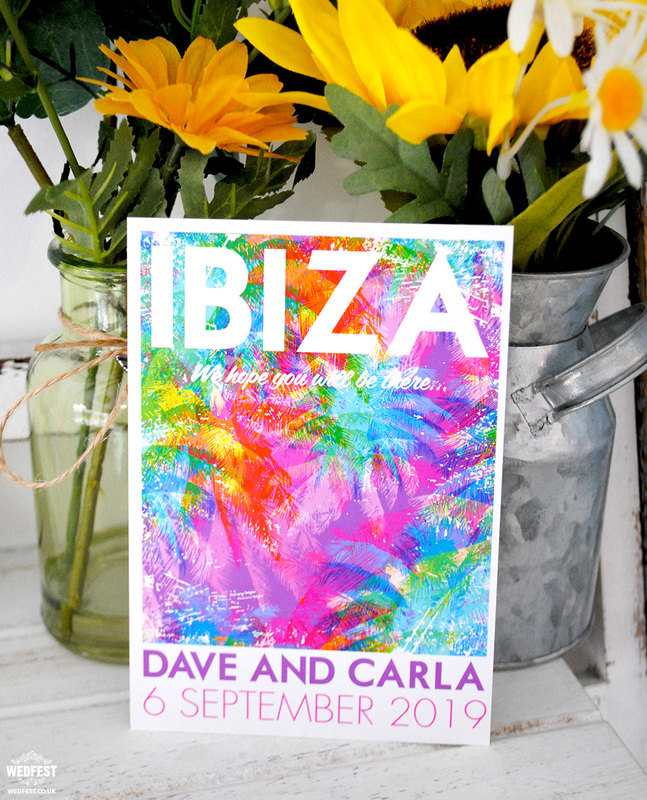 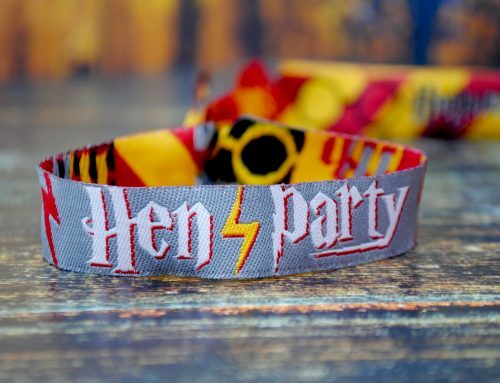 We had a think back to many of our fun nights in Ibiza and looked back through some Ibiza flyers and remember a tropical party that we were at one night. 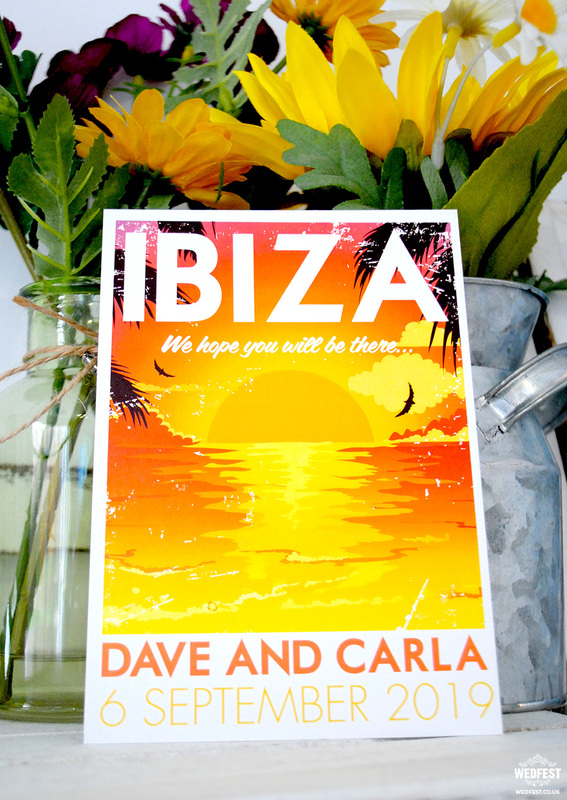 The decor in the club was all palm trees and hugh tropical leaves everywhere in bright neon colours so we thought this would be a good style of image to represent this aspect of the island. 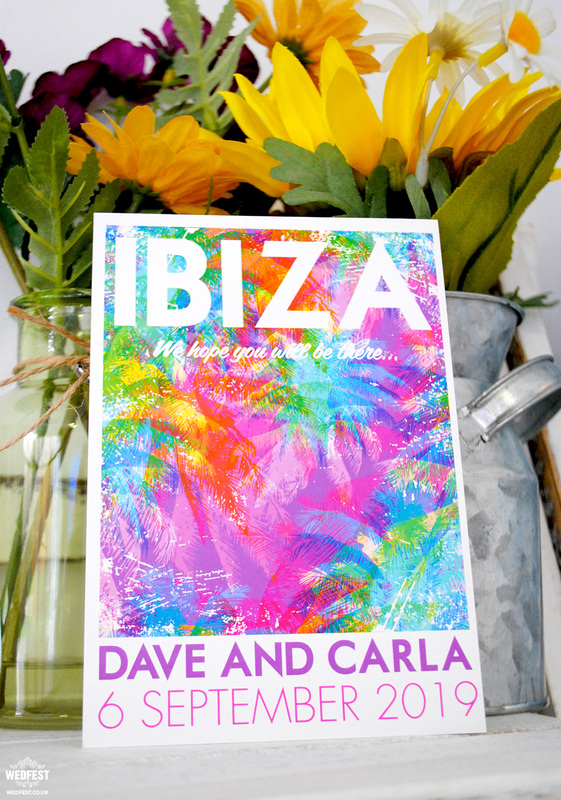 It gets across that tropical vibe and the bright colours remind us on a night out. 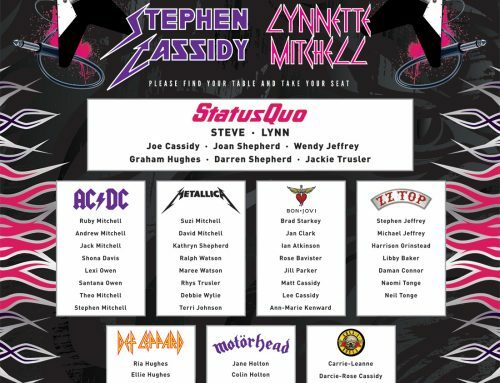 Once we added this image into the poster layout it worked perfectly. 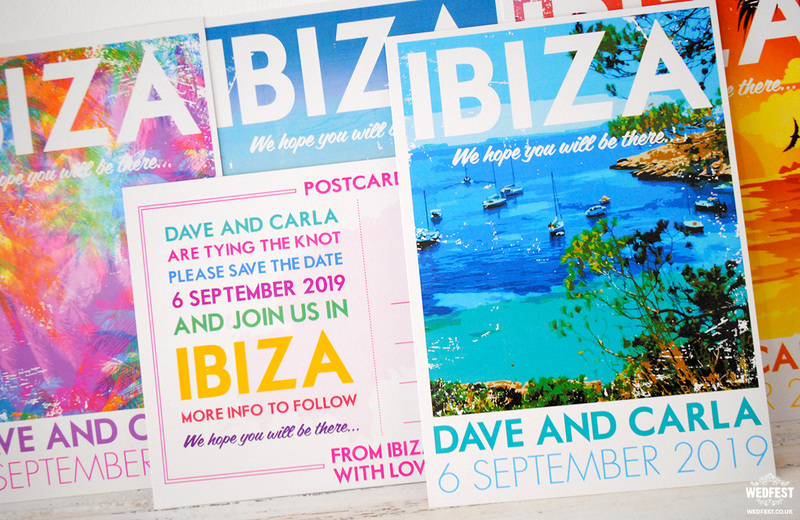 This set of Ibiza Travel Postcards wedding stationery turned out really beautifully and the images look fabulous. 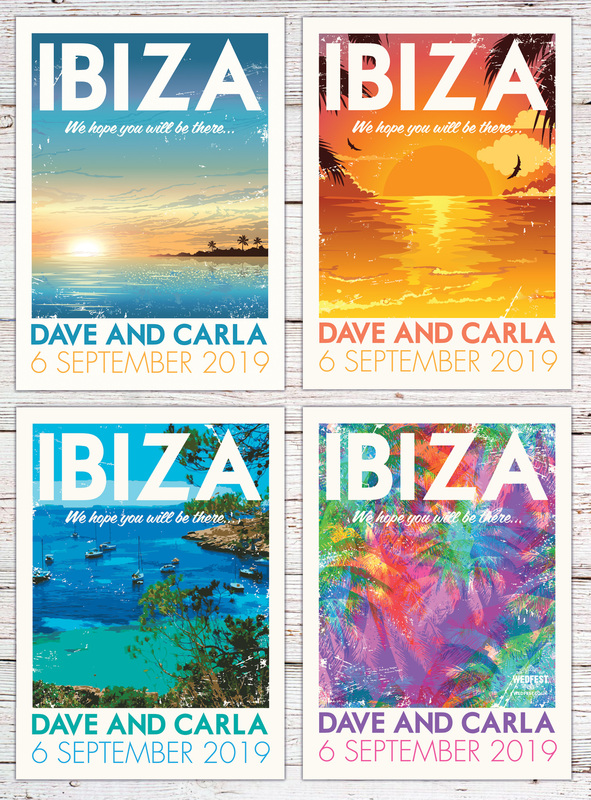 We have also had a request from the couple to blow the images up to full size posters for their house which will look fantastic. 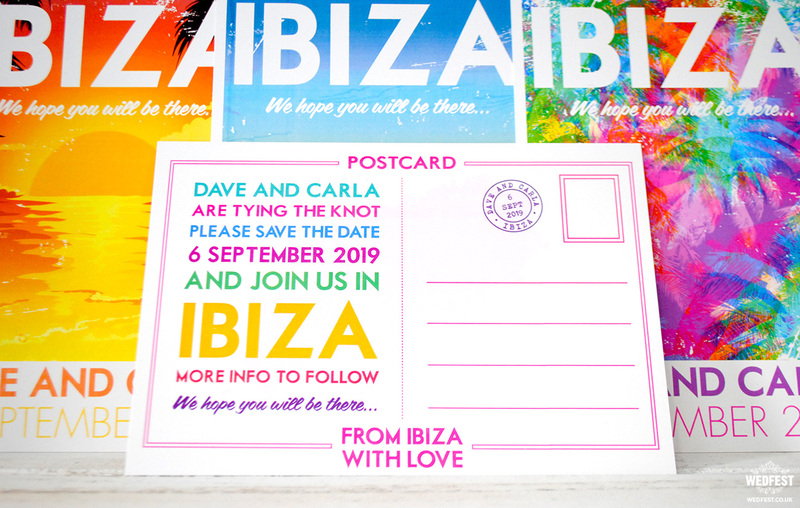 If you are planning a destination wedding and like the idea of having some travel destination posters or travel postcards for your wedding invitations or wedding save the date cards or likewise if you are planning a wedding in Ibiza and want some amazing travel inspired ibiza wedding stationery for your big day then please click here to get in touch.